Guys today I am here with my good friend Hudson Taylor. Hudson is a purple belt from Marcelo Garcia in NYC, he is one of the most talented guys I know. Hudson was a NCAA D-1 Wrestler and he had one of the best pinning records ever. Hudson got his blue belt after 6 months and won the adult IBJJF Worlds, then in purple he won the no gi worlds. Hudson was always one of the guys that helped my wrestling at Marcelos when I trained there and today I asked him to show us a technique. So check it out below and I’ll do a breakdown. So as you guys can see this is a very different take on the traditional ankle pick but it is very good. I think the thing that is most unique here is the grip that he is using. 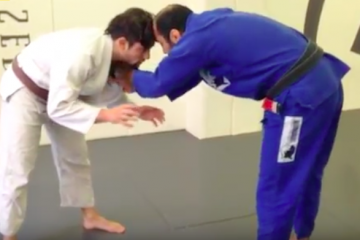 The ankle pick can be one of the best takedowns in the gi with bjj because this is a takedown that you can do even if your opponent is holding onto the collar. A lot of times the lapel grip can nullify a lot of takedowns but this is one that you can do with a lot of distance between you and your opponent. The way that Hudson is doing it is very unique because of the grip. Hudson is anticipating that his opponent will move their lead leg and he is going to attack the other leg when they do. This is simple and effective, I hope you guys enjoyed, oss! Better For BJJ: Wrestling or Judo?